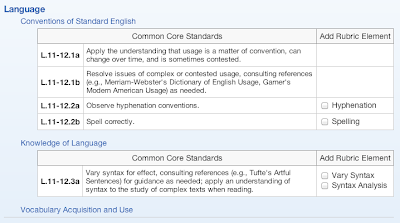 : Latest Update: Language and Speaking & Listening Common Core standards added! 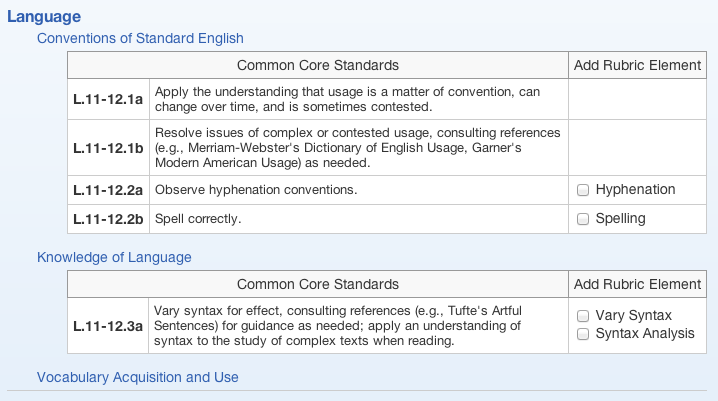 Latest Update: Language and Speaking & Listening Common Core standards added! Based on teachers' feedback, I've added the Language and Speaking & Listening standards to our Common Core Rubric Creation Tool. The Language standards are necessarily quite mechanical (e.g. L.9-10.2a is the semicolon) and as such are often more suited to drill-and-skill type exercises and assessments, though certainly an instructor could construct an essay rubric that included a few specific mechanical elements. The Speaking & Listening standards are, not surprisingly, even further afield from EssayTagger's emphasis on essay assessment. 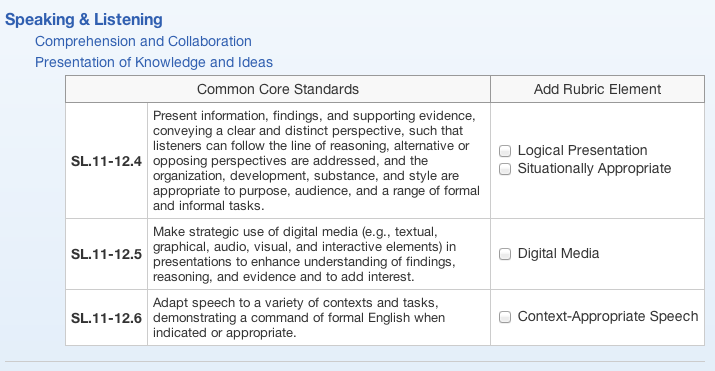 However, the Common Core Rubric Creation Tool isn't limited to just EssayTagger use and teachers did request that this standard be included. And, if you're a little creative, there actually are ways to make the Speaking & Listening standards work within EssayTagger (e.g. evaluating students' self-assessments after delivering a speech). Both of these Common Core standards were added to the tool as a direct result of teacher requests. I had intentionally passed them up when I originally released the tool. We are incredibly receptive to instructor feedback so keep the comments coming!